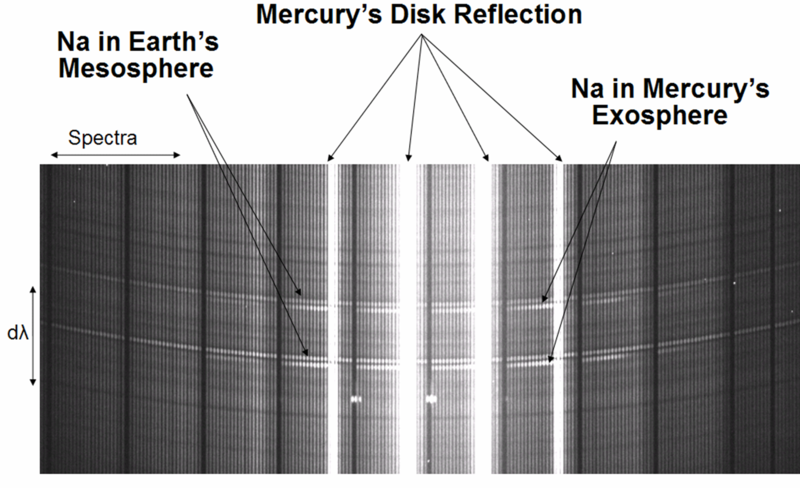 Gas in Mercury's atmosphere is so rarified that collisions between particles occur with negligible frequency. Like the atmospheres of Earth's Moon and Jupiter's moon, Europa, we refer to this very thin atmosphere as a surface-bound exosphere. It's an environment where the standard definitions of pressure and temperature do not apply. The composition of Mercury's atmosphere is similar to our Moon and it reflects the rocky surface material: calcium, magnesium, sodium, potassium, iron, aluminum, manganese, oxygen, as well as some elements that are brought in part from solar wind like hydrogen and helium. Photo-desorption, meteorite impacts, themal evaporation and sputtering are all processes that sustain a very thin atmosphere on this planet. The community has debated the relative importance of each process on the different atmospheric constituents for nearly 40 years; progress has been incremental with consensus being hard won. Many major advances in our understanding can be attributed to the MESSENGER mission which orbited from 2011 to 2015. Like all scientific leaps, the data from this spacecraft raised many new questions while resolving a few old ones. ESA and JAXA are in the partnering on mission called BepiColombo: two orbiters arriving in late 2024 with more advanced and sensitive measurement capabilities. Sunlight blows Mercury's atmosphere into a comet-like tail. The tail is often mistaken as an effect of the solar wind, but it's mere sunlight; solar photons impart momentum when they scatter off the atoms and Mercury is very close to the sun. The photon scattering rate is particularly strong for alkali metals like sodium and potassium so these form the most distinct tail structures. Scattering depends on Mercury's Doppler shift and distance relative to the Sun, so the atmospheric escape rate strongly varies with season. Using a 10 cm coronagraph at McDonald Observatory, I've at times recorded the sodium atmosphere extending to distances of 2.5 million km, making it one of the largest structures in our solar system. The field of view above is 7 degrees of sky. Mercury is behind the black filter strip, the Pleiades are to the right, and trees on the horizon are smeared by tracking during this 6 minute exposure. Below is a movie of Mercury's comet-like tail, which I've processed using 2 days of images from the HI-1 instrument on the Sun-orbiting STEREO-A spacecraft. The waves moving through the background are due to Thomson scattering of electrons in the solar wind. The tail shows characteristics common to sodium, although that prognosis is not yet definite. Mercury's tail points nearly along the line of sight, whereas these solar wind structures scatter preferentially perpendicular. This means that the planet is in the foreground and the solar wind is in the background, and so my 'white whale' of observing Mercury's atmosphere react to solar activity is not acheivable by this technique. Some scientists think the planet's atmosphere's largely static, with only seasonal variability. Others are confident the atmosphere exhibits large changes on hourly timescales due to it's interaction with the solar wind and interplanetary magnetic field. I'm somewhere in the middle, but I lean towards the latter more than most. On May 9, 2016, colleagues and I traveled to the National Solar Observatory just down the road from Apache Point. 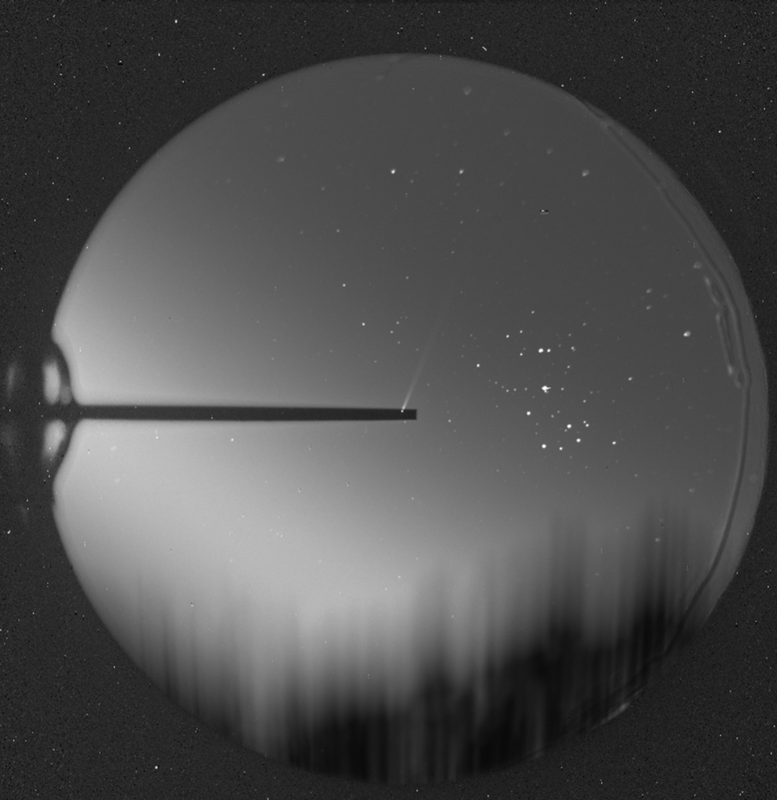 The IBIS and HSG instruments on the Dunn Solar Telescope measured absorption in Mercury's atmosphere as it transited between Earth and the Sun. The transit data tells us how lopsided the atmosphere is in each direction, north-south and dawn-dusk. The jet stream was right overhead so our seeing wasn't very good, for the tip-tilt correction. On the other hand the adaptive optics data from FISS at Big Bear Solar Observatory are fantastic. We're writing up these results now, so I won't preview them, except to say the atmosphere's similar to Helmold Schleicher's 2004 transit measurement, but the new data have higher spatial, temporal and spectral resolution. With luck and careful data reduction, we may even see some variations in the atmosphere during our 5 hour observation window.